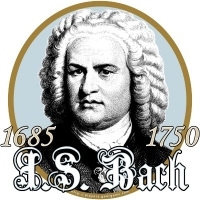 Baroque composer Johann Sebastian Bach was famous for his prolific cantatas, sonatas, concerti, orchestral suites, chamber, sacred and choral music, oratorios, masses and organ works. Here you will find his portrait on t-shirts, hoodies, mugs and ceramic items, bags, mousepads and other quality gift and apparel items. Buy one now for your favorite musician, music teacher or student, exclusively from GearGems! Lovers of Bach and piano or other music teachers may also wish to check out a design featuring one of his most famous quotes.